So I've been experimenting with my first solar setup for about two weeks now. Below is a list of observations I have made and a few questions I have regarding my findings. One of the first things I observed is that the best way to calculate how much I will be drawing on my battery is to multiply my AC Amps by ten. I tested this by comparing the amp reading in my Kill-a-watt meter to my DC amp meter. Secondly, It seems to be a much wiser plan to use anything higher than 12v system. I learned very quickly that wiring can be very expensive on a 12 volt system. Lastly, I've learned that batteries capacity can be somewat hard to read. A battery would need to be withoutno load or charge for a few hours to tell its true state. Thing is, in a solar setup, a battery is always under load or charge. How do you calculate your remaining battery capacity given your draw rate while under load? V is the voltage at any given point in time, 11.4 is 0% charge and 1.5 is the full charge range (i.e 11.4 + 1.5 = 12.9 or max charge). As stated ealier, it is impossible to calculate state of chatge while under load or charge. Let's speak hypothetically for a second; If I am drawing 10 amps DC and my voltage at the moment is 12.6. With a battery of 79ah, does this mean that my remaining capacity is 63.2ah and I have alittle over two hours before I reach 50% of my battery capacity? 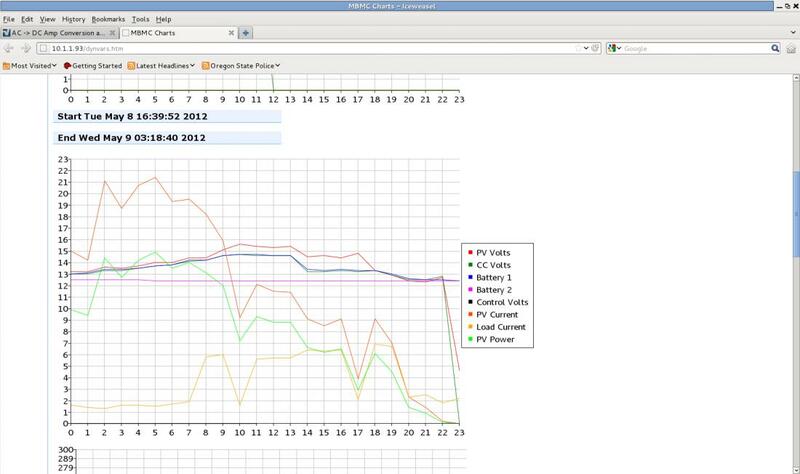 Estimate runtime before 50% state of charge = (80% * 79ah) - 39.5 / 10amps = 2.37hours? 39.5 is 50% of my total capacity by the way. it's not impossible, just complex. You need at least two current devices to see all the details. One to measure the total input current to the battery plus load and another (in the return wire from the battery to ground) to measure the net current (positive or negative) into or out of the battery. 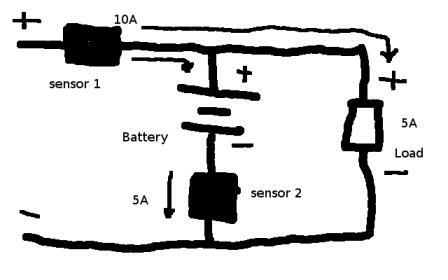 A controller can monitor the voltages and currents to track total the total Ah/kWh in and out from the battery with CEF corrections for energy flow in depending on the State of Charge (this is tricky) and corrections using a simple Peukert/electrical/analytical model for energy flow out. The concept is simple but the devil is in the details of keeping everything in sync with reality. A single sensor can track the battery but it misses information needed to see how power is being used in the whole system. Very interesing and useful data. What are you using to monitor this stuff? 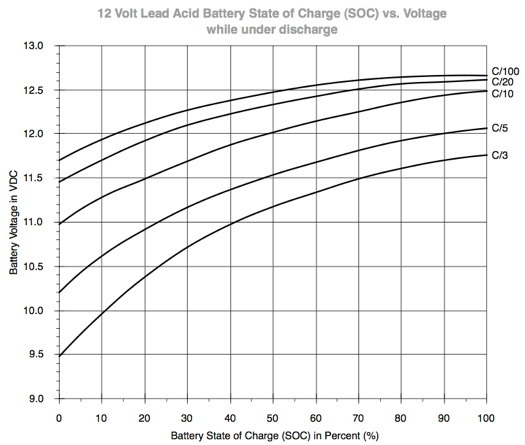 Example: if you were discharging 30 amps from a 300 AH battery you would use the C/10 curve. At that discharge rate if you were reading 12 volts at the battery, you would be at a 50% state of charge. Of the main mechanisms that affect terminal voltage only some can be modelled electrically which limits accuracy (sometimes by large amounts) under dynamic conditions. Very interesting read. I must admit though, most of this stuff is waaay over my head. I will have to read some of this stuff more than once.